Obituary – Ritthaler, Frank « Perry High School Alumni Association, Inc.
Frank Ritthaler, Jr., son of Mr. and Mrs. F. F. Ritthaler, 1212 Sixth street is a native of Perry, having been born here 17 years ago and living here since. Frank is a member of the DeMolay. He recently passed the army V-12 tests in the examinations held in April, and will be inducted into the service after graduation. ﻿Pfc. Frank Ritthaler. Jr., 19-year-old son of the Noble county assessor, Frank Franz Ritthaler, was killed in action December 25 in the European area. Ritthaler was reported missing in action on January 15, and a letter received from the adjutant general by his parents soon after said he was aboard a troop transport that was sunk on Christmas day. 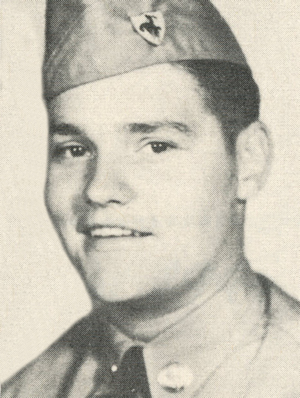 Ritthaler, a graduate of Perry high school with the class of 1943, entered V-12 training in August, 1943 at Stillwater, where he trained until February, 1944, when he went into active duty with the infantry. He was sent overseas November 12. 1944, having been stationed at Camp Hood, Texas, and Camp Rucker. Ala.
His family, 1212 Sixth street, last heard from him December 22, when they received a cablegram sent from England. Christmas day, the day he was reported missing, was his 19th birthday. Mr. and Mrs. Ritthaler were both out of town when the telegram was received, but Ritthaler’s office was able to locate him in Oklahoma City by telephone to give him the information. A member of the infantry signal corps, Rittlialer has a half-brother, Richard, in the army air corps at Biloxi, Miss. Ritthaler carried papers for the Perry Daily Journal for four years. Of all the Noble county young men who have gone down to the sea in ships, who have taken off into the dim unknown from flaming aircraft or who have come to the end of the trail before some flaming barricade in some far off land, it seems that the report that little Frank Ritthaler is missing in the channel after the sinking of a transport on Christmas day has depressed me most, and I guess most of the rest of the old-timers on the Journal staff. For Frank was one of the Journal carriers for many years and he was a fellow who made a real impression wherever he went. Frank was more than just one of the Journal carriers – boys who by and large are quite a little above the average. For in that picked group his outstanding energy and ability made him stand out. He was a tireless worker, a loyal and consistent fellow with a sturdy and upright character. “All other boys do that” did not mean a thing to Frank. Possessed of a keen intellect and a brilliant mind. Frank thought out his own problems, figured out a proper course of conduct for himself and hewed right to the line in his work, in his school and even in his play. When many a lad his age was wandering around trying to find himself, scattering his energies and his talents and wasting many a precious hour in the fine old art of loafing, Frank was forging rapidly and tirelessly on. Frank wasn’t much of a hand for sporting events and social affairs. His active mind and his tireless energy even as a little fellow was devoted largely to sturdier doing and to those pursuits that add to man’s knowledge and made for real success and happiness in life. War is an unerring deterrent for the human race. Man will never know just why it is that war takes first those young men who show the most ability and the most promise for a full and successful life. Of that host of former Journal carriers who are serving in the armed forces all over the globe, none showed greater ability or greater promise than Frank and little Paul Pricer, another Journal carrier of eight or 10 years ago, who lost his life early in the war. It passeth understanding – but you have only to read the list of those who have died from Noble county to know this is true – they were among the best – those who have already gone. Frank is now listed as missing. It may be that he will yet turn up.